A pregnant woman suffered a slew of serious injuries after a carjacked ambulance crashed into the car she was in Sunday, killing a family friend. Police said 34-year-old Sebastian Kellinger Isaksen had been in an accident along Interstate 495 and when an ambulance crew arrived, Isaksen attacked them and stole their ambulance. Isaksen drove the ambulance down I-495, exited at Kenilworth Avenue and turned left on Greenbelt Road. About 15 minutes after the ambulance was stolen, it crashed into three cars on Greenbelt at 62nd Avenue, police said. The driver of one of those three cars, 77-year-old Alvin Hargrave of Greenbelt, was critically injured and died shortly after he was taken to the hospital, police said. Cheryl Linkins, 36, was in the car with Hargrave and survived but suffered a broken pelvis, a broken left hip and other neck and hip fractures. "My life has changed so much," she said from her hospital bed Wednesday. "The first couple days I thought it was just a dream. I remember after the impact, I [looked behind me] and the whole back seat was at my head ... I think that's the last thing I remember." 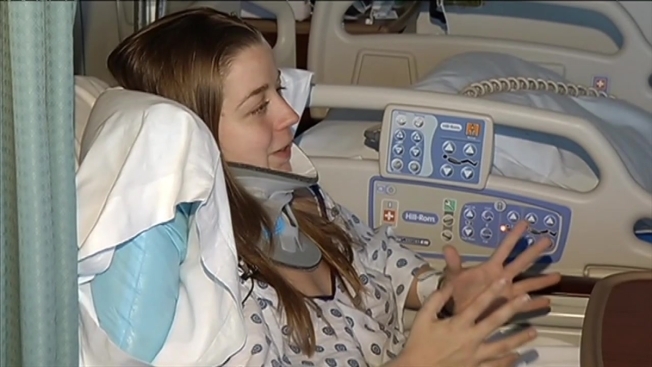 Doctors told Linkins it could take up to four months until she walks again. She'll undergo a cesarean section. Hargrave had worked as a Montgomery County teacher for decades. "I even tried to call his phone to hear his voice and I just know it's not gonna happen again," Linkins said. Isaksen's crime spree didn't end there. He careened down an embankment, police said, and struck nine unoccupied cars in the parking lot of a Joe's Crab Shack restaurant. He was arrested as he left the ambulance's cab and was taken to a hospital with critical injuries.